Every time I’ve cycled up Mt Lemmon I’ve looked at the Seven Cataracts cliffs and wondered what it would be like to climb up the cliffs. 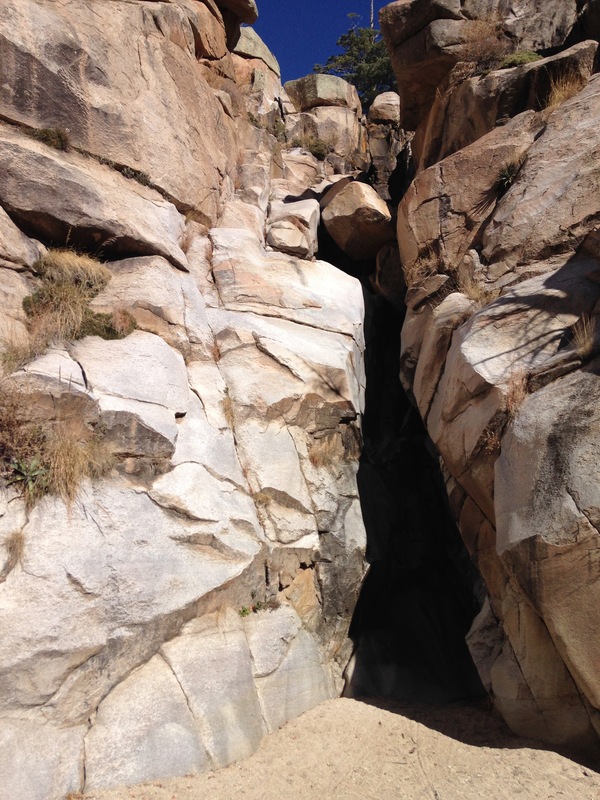 The canyon that leads down into the cataracts is Willow Canyon, and it is sometimes done as a descent with several rappels over the cataracts, but not often as an ascent. I finally decided to try the climb on 12/20/2017. It’s been a very dry autumn so there was no water flowing in the canyon, which made climbing the rocks easier than it might have been. Seven Cataracts and Willow Canyon is a wonderful scramble/climb, not very long but quite technical in places, with plenty of class 3 and 4, and depending on what route you take, perhaps some easy class 5. I did this wearing La Sportiva approach shoes which made the climbing feel fairly secure. Start at the Seven Cataracts parking area on the Mount Lemmon road. Cross the railing at the right hand end of the parking area then follow the trail as it works its way down the hillside. Eventually the trail peters out and you continue down and leftwards to the canyon bottom. Walk up the canyon bottom to the cliffs at the base of the Seven Cataracts canyon. The easiest way up this initial section is up rocks and grass on the right hand side of the cliffs, with a tricky move left into the canyon bed at the top of these initial cliffs. 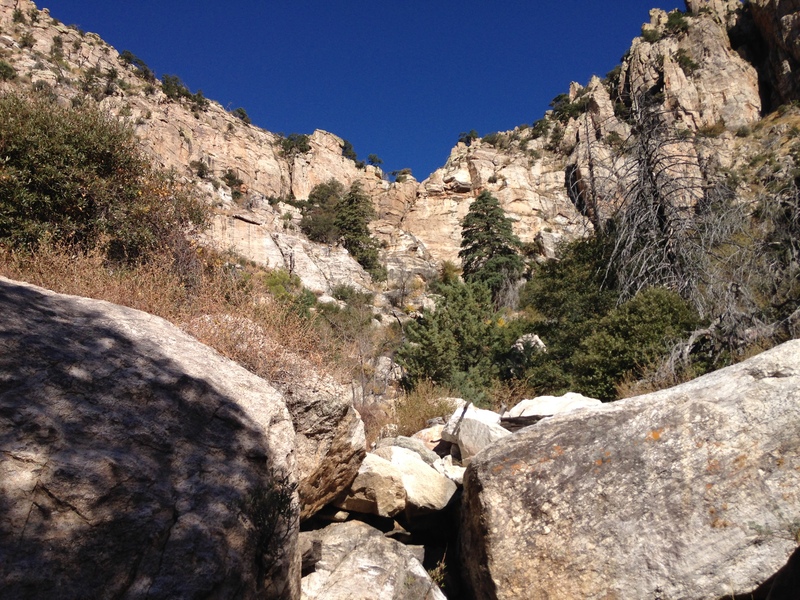 Hike and scramble up rocks until you reach a big cliff above a pool. This is where one of the big rappels comes down and it looks rather scary to climb. I climbed up rock ledges round to the right, although you could go even further right to avoid even the rock ledges. Move back left as soon as you feel comfortable and make your way to the canyon bed. At the next cliff head left up big boulders then back up right to a big flat area below an evil looking black cleft. Follow a line of trees up left then climb rightwards up a rock gully finishing under a big boulder. You will now see the rappel anchors above the black cleft. The least scary way from here is to face out then climb up and move right using big sharp handholds. Wander up for a few bends to another cliff with a chimney in the back. Since it was dry I climbed the chimney directly but you could skirt this whole section by scrambling up on the left. From the top of the chimney a log leaning right across a pool gives access to a shelf that give you an easy exit. 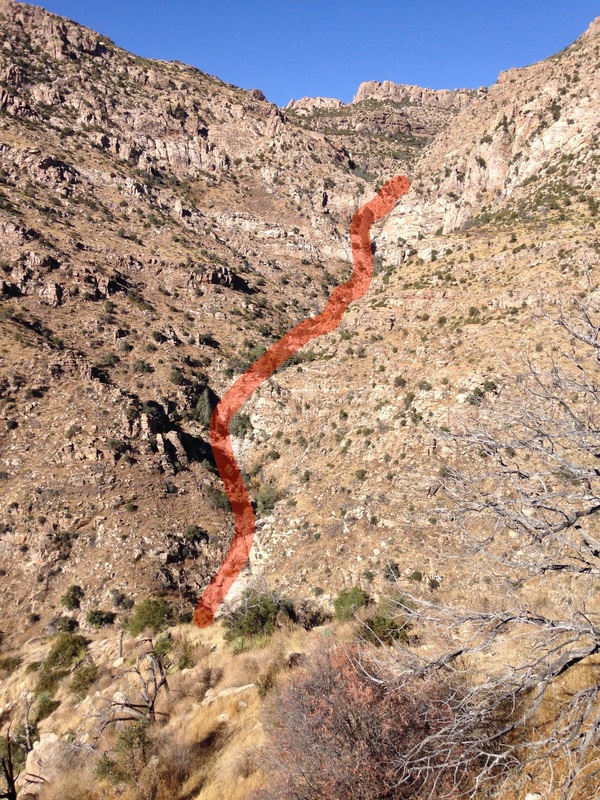 This is the end of the technical scrambling and from here the canyon bed becomes much more vegetated. Whenever you feel like it, head up right to the rocks on the ridge then follow the rocky ridge northwards. At some point you will find yourself on a good trail that leads to Windy Point. Here is a page about descending the Seven Cataracts. Here’s another page about the descent and its rappels. And here’s yet another page about the descent and its rappels.